The miracle of Russell T. Davies' latest incarnation of "Doctor Who" is how it takes the best parts of the previous series, and ramps it up just a bit — every episode, no matter how big or small, feels apocalyptically urgent, yet genially self-mocking of its own grandiosity. 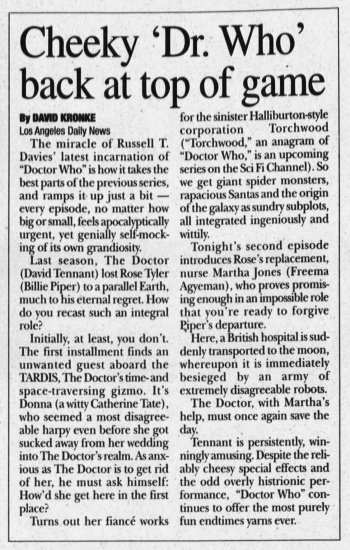 Last season, The Doctor (David Tennant) lost Rose Tyler (Billie Piper) to a parallel Earth, much to his eternal regret. How do you recast such an integral role? Initially, at least, you don't. The first installment finds an unwanted guest aboard the TARDIS, The Doctor's time-and space-traversing gizmo. It's Donna (a witty Catherine Tate), who seemed a most disagreeable harpy even before she got sucked away from her wedding into The Doctor's realm. As anxious as The Doctor is to get rid of her, he must ask himself: How'd she get here in the first place? Turns out her fiancé works for the sinister Halliburton style corporation Torchwood ("Torchwood," an anagram of "Doctor Who," is an upcoming series on the Sci Fi Channel). So we get giant spider monsters, rapacious San tas and the origin of the galaxy as sundry subplots, all integrated ingeniously and wittily. 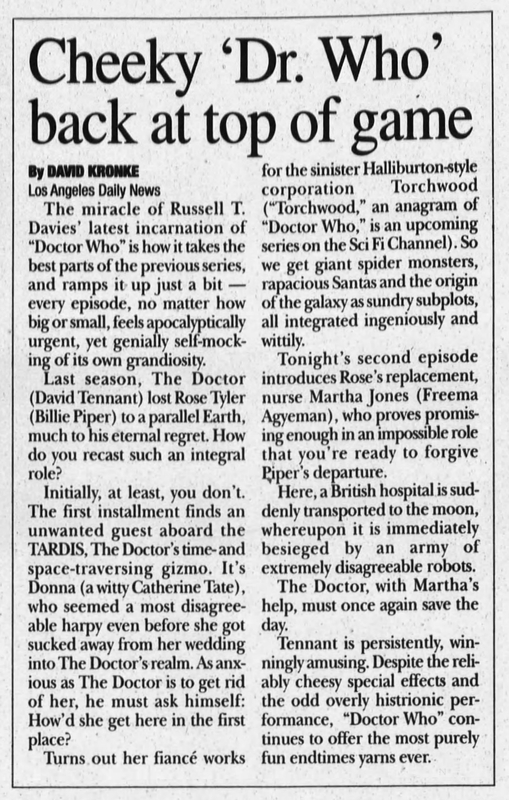 Tonight's second episode introduces Rose's replacement, nurse Martha Jones (Freema Agyeman), who proves promising enough in an impossible role that you're ready to forgive Oper s departure. Here, a British hospital is suddenly transported to the moon, whereupon it is immediately besieged by an army of extremely disagreeable robots. The Doctor, with Martha's help, must once again save the day. Tennant is persistently, winningly amusing. Despite the reliably cheesy special effects and the odd overly histrionic performance, "Doctor Who" continues to offer the most purely fun endtimes yarns ever. APA 6th ed. : Kronke, David (2007-07-05). Cheeky 'Dr. Who' back at top of game. Rutland Herald p. C6. MLA 7th ed. : Kronke, David. "Cheeky 'Dr. Who' back at top of game." Rutland Herald [add city] 2007-07-05, C6. Print. Turabian: Kronke, David. "Cheeky 'Dr. Who' back at top of game." Rutland Herald, 2007-07-05, section, C6 edition. This page was last modified on 15 April 2019, at 02:35.